One Isatis feature the French Oil & Gas consulting company Beicip-Franlab particularly appreciates is Grid Operator, a tool allowing them to run connectivity analysis over large seismic attributes volumes. “We are commonly using Isatis for running connectivity analysis over large seismic attribute volumes in the frame of both fracture network and matrix characterization projects. 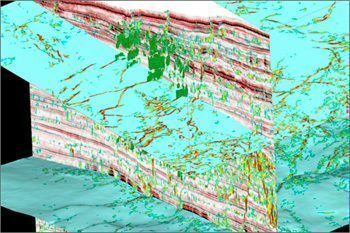 In particular, for fracture analysis, we first compute an attribute (so-called fracture index) that outlines discontinuities of seismic events”, Beicip Head of Seismic Reservoir Characterization Group Gaël Lecante explains. “Then, we apply the “erosion” grid function from the Grid Operator to discard the smallest objects (associated to noise) and run the “labelling_cross” function to identify the connected components (this includes the sorting out of the components according to their size). Lastly, we visualize the faulted network in Isatis 3D Viewer, keeping only the largest discontinuities (most likely associated to faults) in the view (applying the filtering function), before exporting them in our geophysical interpretation systems”. “Isatis Grid Operator is really a high-performance tool”, Gaël Lecante adds. “It allows us to achieve connectivity analysis on huge seismic volumes in half an hour, even on about 2 billion-cell grids, compared to the several hours it usually takes with other software packages. At the end, we completely identify the fracturing volumes”. Isatis Grid Operator has been designed to perform morphological operations on grids. It has many other applications, including reservoir structure analysis or image processing.